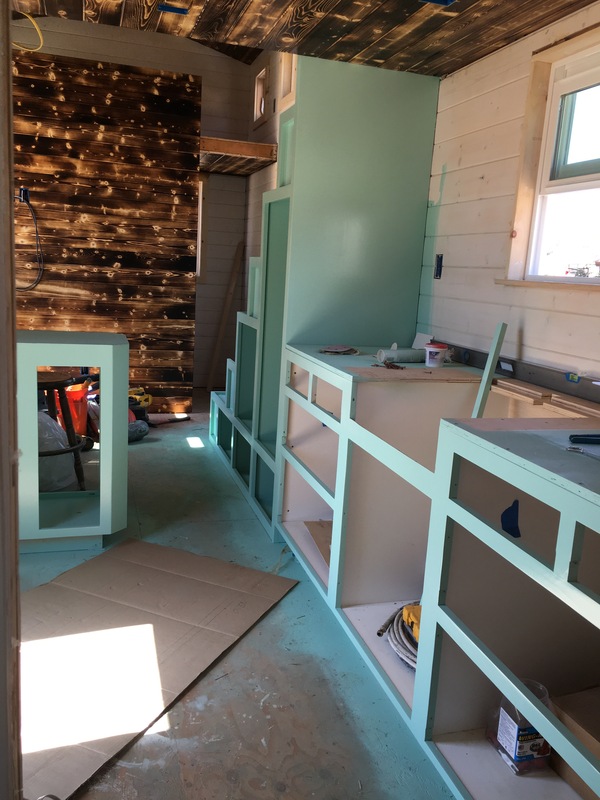 A month ago, while the tiny house was still studs and insulation, we started the process of building our kitchen cabinets. 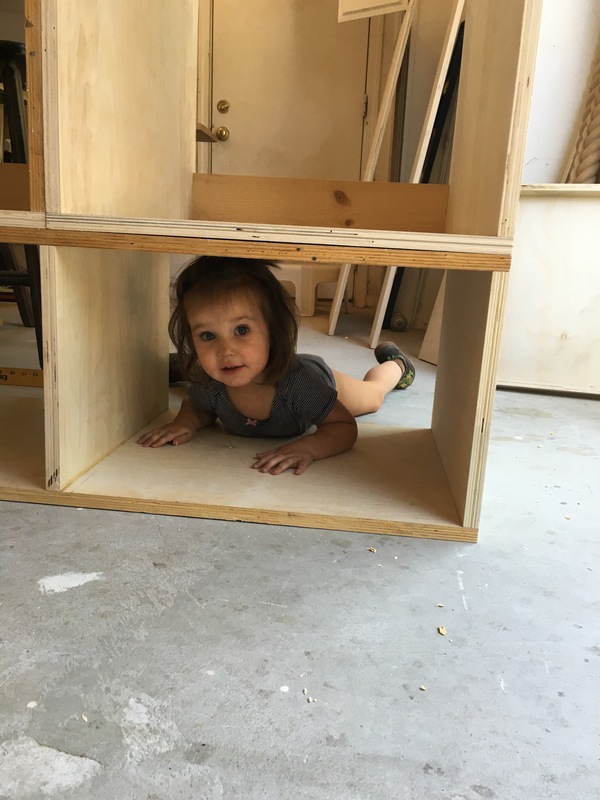 Originally, we were going to use a local cabinet company, but soon after getting their price quote, J’s grandpa Bud came to us and asked us if we would like him to build them. Of course we said yes! 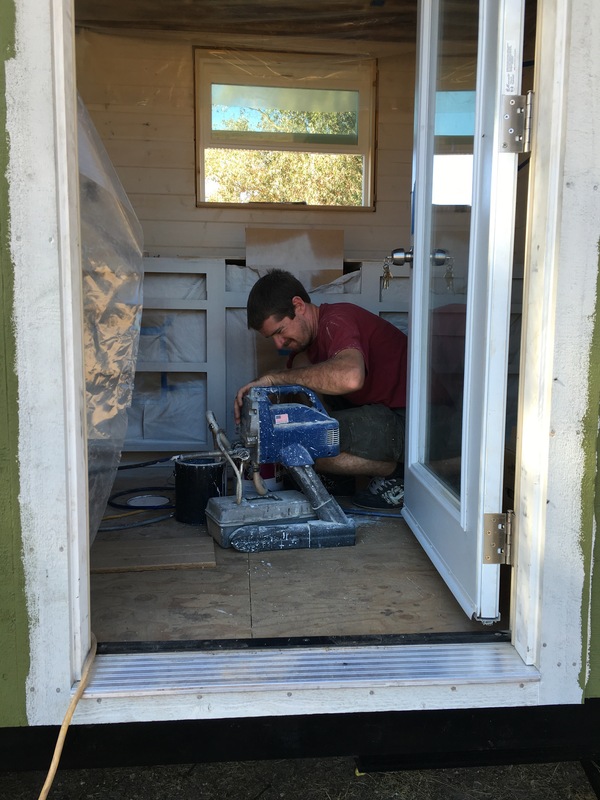 Knowing that a loved member of the family wanted to take time out of their day to help us reach our dream tiny house always means the world to us. Plus we could customize them to our hearts content! 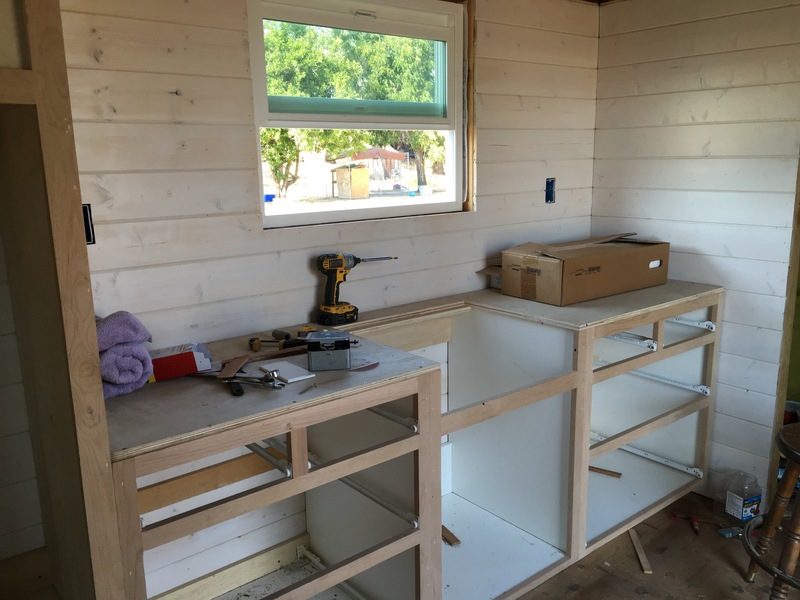 For the cabinets under the kitchen window, we opted for drawers rather than doors. Drawers were just more preferable to us over doors because I hate digging through items in the front to not even find what I was looking for in the back. 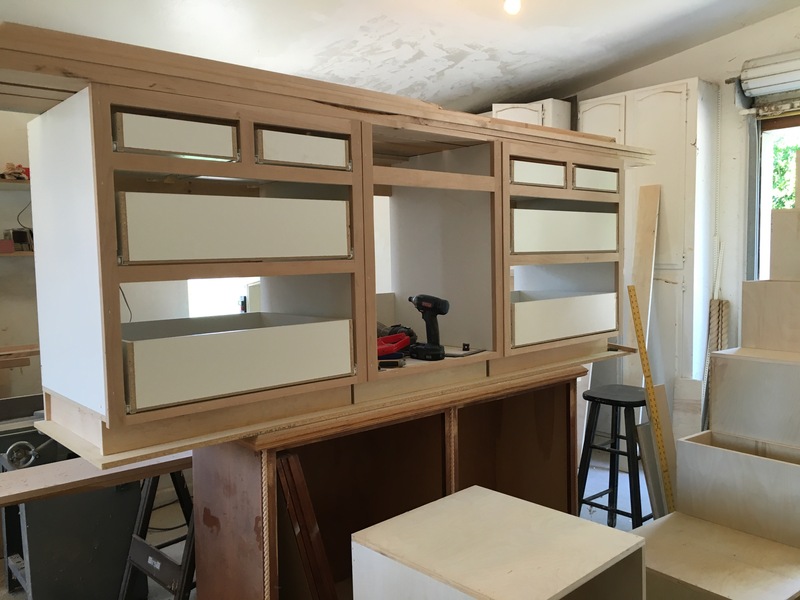 Our kitchen layout has our oven next to the front door, so we wanted a cabinet next to the stove to use as a prep counter/dining area, so the peninsula was created. This is also where pots and pans will be stored. J and Bud had fun designing the stair case. 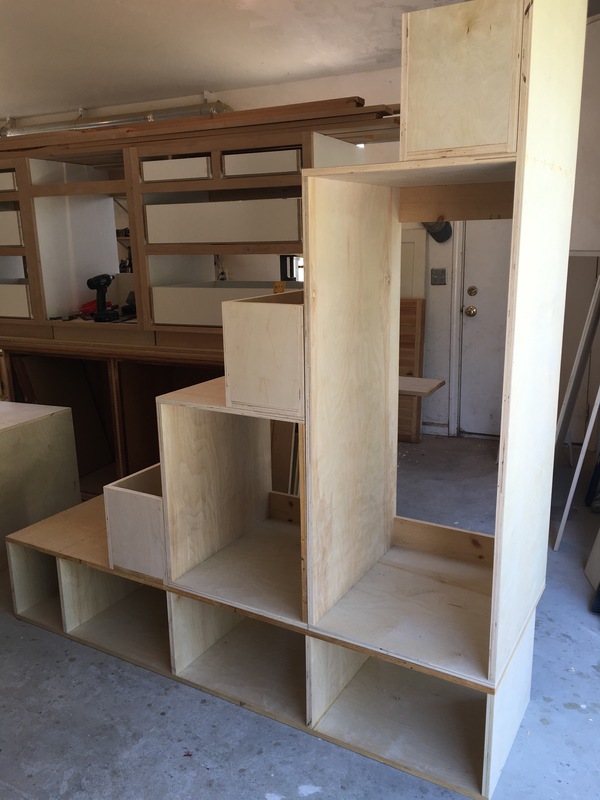 As any tiny house dweller knows, storage is key, so they crafted the tiny house stairs with maximum storage capability. W is already trying out her hidie-hole options. 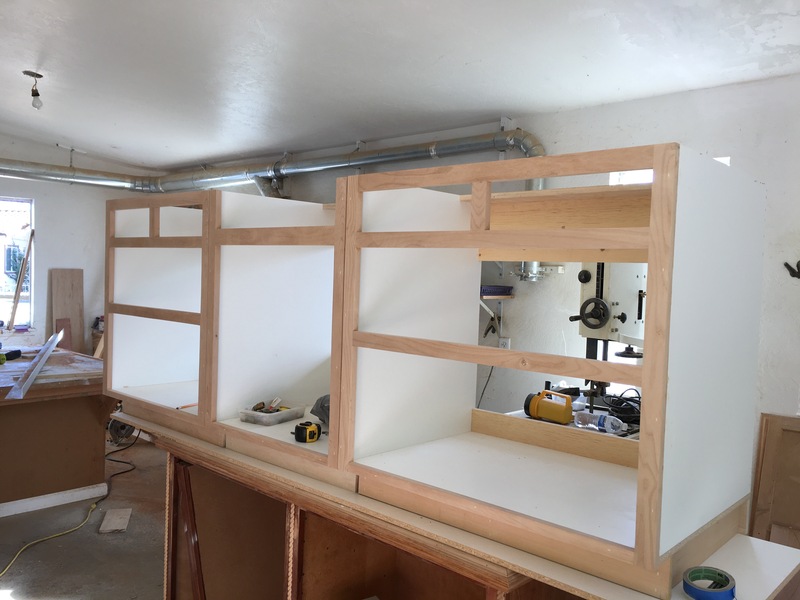 Cabinets with the face frame and drawer inserts are coming along nicely! Once built, it was time to install them. J decided to paint them with the spray rig after they were installed. 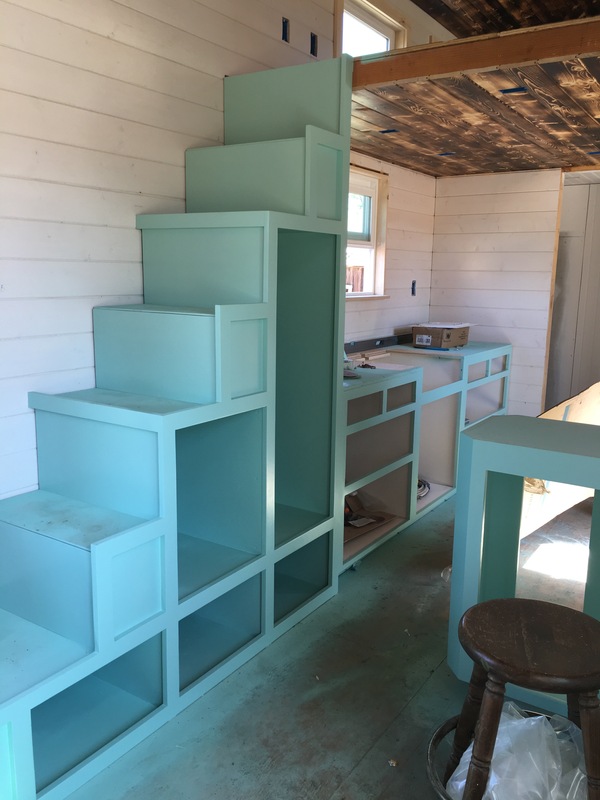 Before painting, we had to decide on a color. 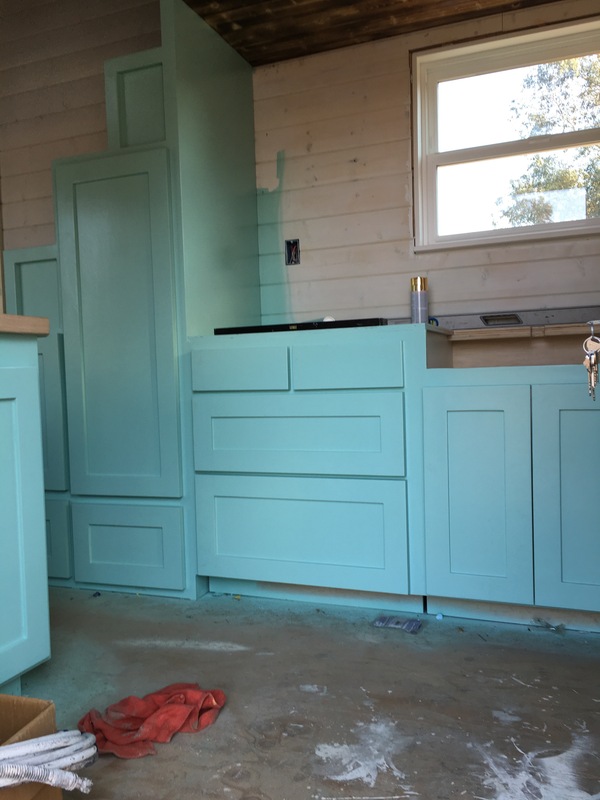 We didn’t want the house to feel too dark and cramped, especially in a tiny house, so we opted for a light, bright and cheery color. Walls were draped in plastic and masking tape was applied. 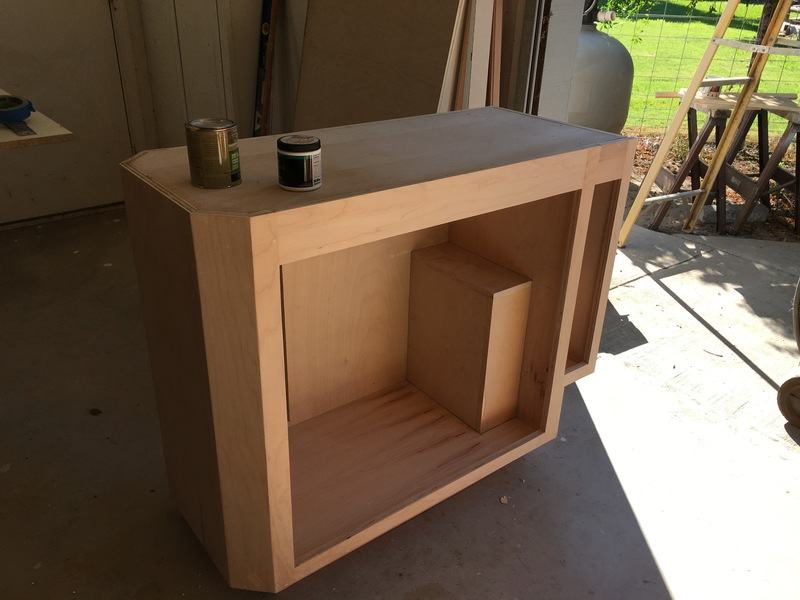 First, J applied the primer coat. Then it was ready for the color. Told you it was light, bright and cheery. With all the plastic and tape taken down, it looks a million times better. 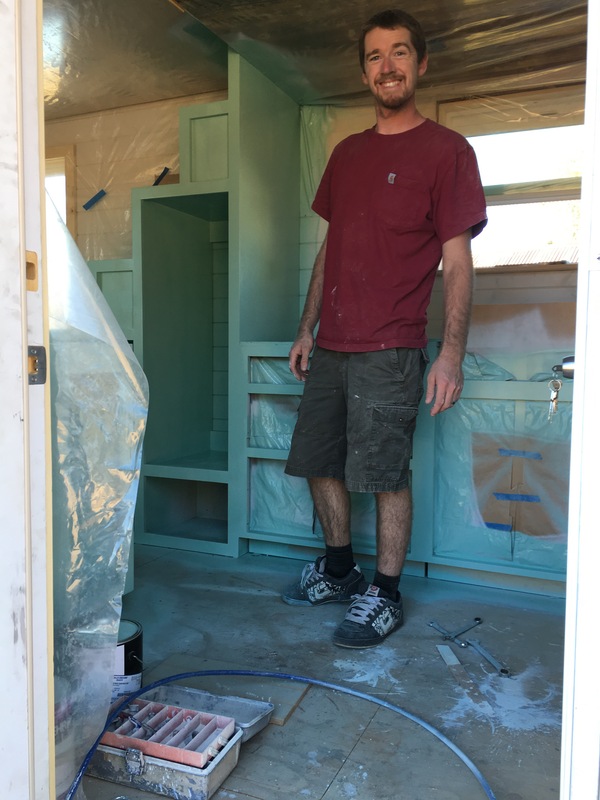 The color goes so well with the burnt pine that whenever I step foot into the tiny house, I can’t help but smile. 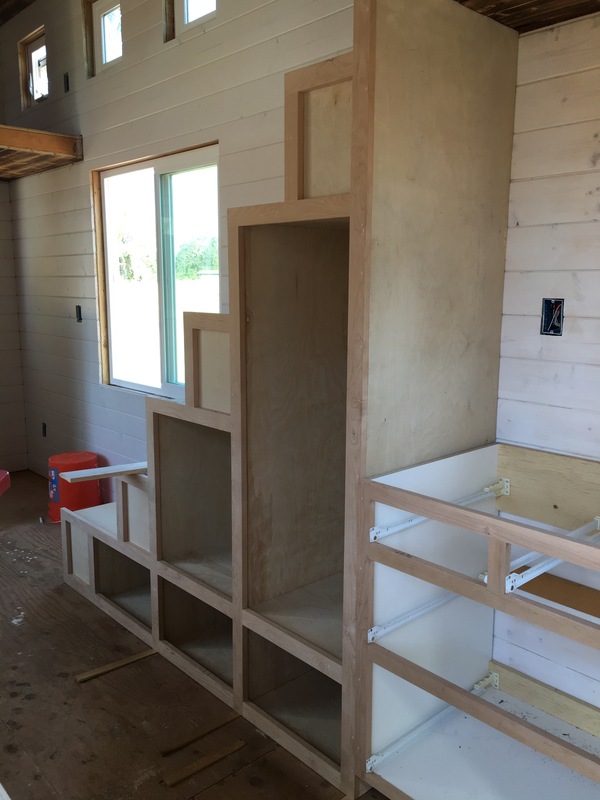 All the drawer faces were put on next. It definitely makes the space feel more like a kitchen. 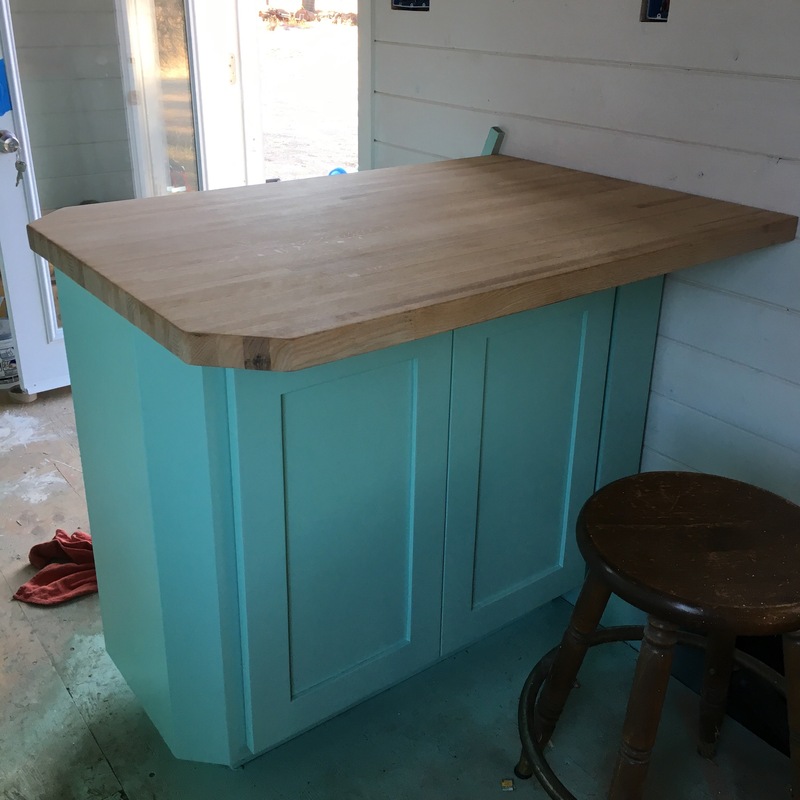 As for the peninsula, Bud had an old piece of butcher block lying around, so they cut it to the size we wanted, sanded the heck out of it and then screwed it on. 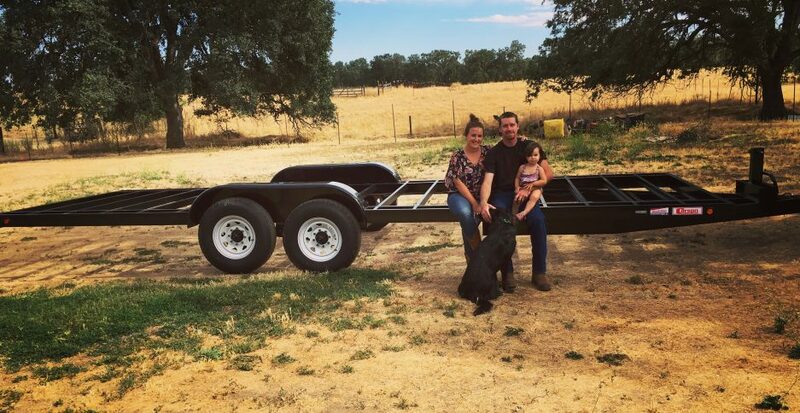 Our completion end goal date is October 1st and since J and I are getting so close to the end, we decided that we want to keep the final reveal a surprise. Please stay tuned for all the final details!